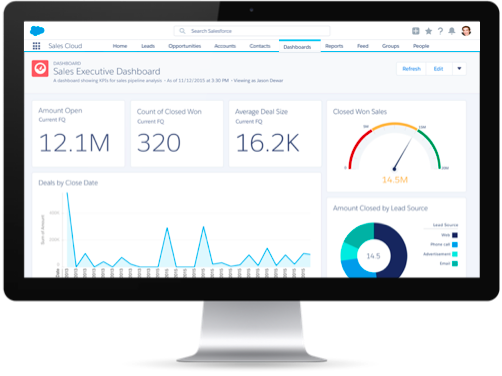 Summarize the power of Sales Cloud reports and dashboards. Describe features of Sales Cloud Forecasting. “You can’t manage what you can’t measure” is a mantra for sales leaders for good reason. When you can accurately measure performance, you can double down on what works best and pull back on what doesn’t. With Sales Cloud, you can see how your sales team is doing in real time. Create reports that reveal what’s in your pipeline, or what’s forecast to close this quarter. By seeing data across the business, you quickly make adjustments to meet and beat your goals. Dashboards are a great way to visualize your most important reports, and share them with anyone. Does that sound like a great way to motivate reps by highlighting their performance? You betcha! If everyone is going to see your report card, you want all “A”s right? Even better, you can build dashboards with clicks, and no code. Now there’s a test anyone can pass. If an exec asked you how the quarter looks, would it be hard to gather that info? Not with Sales Cloud. Use the forecasting tool to easily see a real-time view of forecasts throughout the organization, including in-line forecast adjustments, and drill down just by clicking. Keep your forecasts accurate with well-defined sales stages—customized to use your exact terminology—and get the entire organization on board. What are the key attributes that qualify a deal as a “commit”? With your team all on the same page, you have a meaningful look into your business and have the data you need to help drive good decisions. You don’t want data entry to stop you from having real-time forecast information, so make it easy for reps to update their deals with the Opportunity Kanban. As reps drag deals into a new stage, their totals recalculate instantaneously, and your organization gets that critical visibility. Now that you know what Sales Cloud is and have some idea of what you can do with it, you officially have enough information to be dangerous. It’s time to ask yourself: “Self, are we ready to modernize our sales process and increase our sales?” Look into the mirror: You are. Contact us to learn more about how Sales Cloud can revolutionize your sales organization. Or take this journey even further with Trailhead! Lots of Trailblazers like you have learned all about Salesforce with Trailhead, and you can too. Just look at what Toya learned.